It’s that time again! Stick around after the service on August 12th as we celebrate the beginning of a new school year. Cornerstone is providing pizza, salad, and drinks. Kids, come enjoy some fun outdoor activities! All families are welcome to attend. 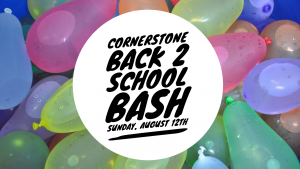 Contact kidzone@cornerstonecommunity.com for more information.